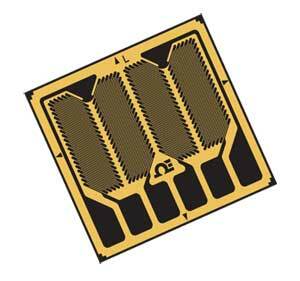 OMEGADYNE® offers full bridge strain gages with transducer quality for shear and torsional strain applications. These strain gages can be used in transducer design for shear beam load cells, or they can also be used for reaction torque on a shaft. SGT-2DD/350-SY** has 2 half bridges strain gauges on one carrier piece. Each half bridge has a dual shear pattern, with opposite grids and a common lead/solder pad. SGT-3/700-FB** has 4 independent shear strain gages, with opposite grid angles, on one carrier, with separate leads/pads (electrically independent). Below we show one wiring example; SGT-2DD/350-SY** used to measure a reaction torque on a shaft. The strain gages have been numbered, and the leads/solder pads labeled.